WWE TLC is in the books, and in it we saw four matches involving a total of 11 women. We’re going to look at the top winners of the night. Not necessarily who won matches, but who came out of their matches, angles, and segments looking as good as, or better than, when the bell rang. 2018 was a pretty good year for Carmella. 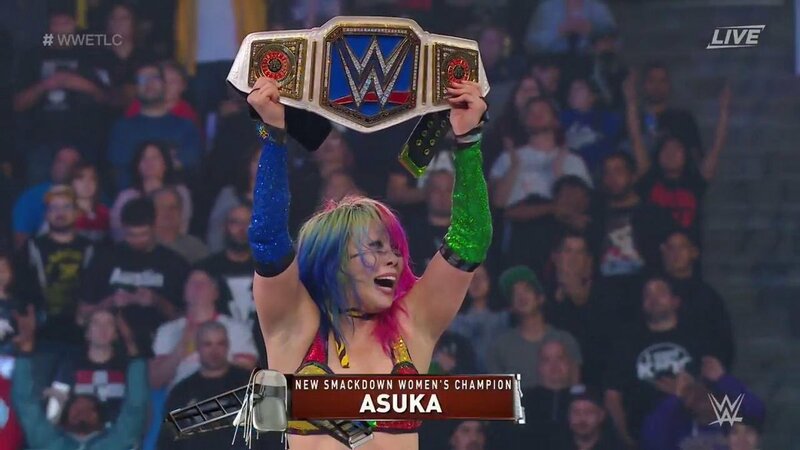 She started off as “Miss Money In The Bank”, cashed in, became champion, and defeated Charlotte and Asuka TWICE. When she entered into the Mixed Match Challenge, it was seen as WWE filling in their content holes, but for Carmella, she became a face again. Winning this tournament put her in the catbird’s seat of the Royal Rumble match, next month. Kudos should go to Mella. With getting the no. 30 entrant, this will keep her relevant throughout January, and maybe she can do some bragging, in the meantime. This year saw Miss Liv Morgan come into her own; her ring work has improved greatly since joining the RAW brand, and after being concussed by Brie Bella, fans came to appreciate her. Last night, in the tables match at TLC featuring Nattie and the leader of the Riott Squad, Ruby, Liv arguably had the biggest moment in the match. We expected numbers to become a factor, but Nattie headed that off. She first disposed of Liv with a shoulder block off of the apron into a table. The speed in which she flew off, and the resulting impact, looked like a million bucks, and Liv looked like she wasn’t living after she hit the floor. It’s little nuances like how she took the table bump that purists appreciate. Not only did she take a bullet (and fly like one) for Ruby by pushing her out of the way, the crying was a nice touch. Ouch town, population you, Liv. Where does Liv go from here? There’s really no way of knowing, but with many talking about her insane table bump, if she keeps this up, she may be the breakout star we know she can be. We all know by now of the tragic passing of Natalya’s father Jim “The Anvil” Niedhart. Of course, WWE being WWE couldn’t pass up a chance to exploit a death for TV (Brian Pillman, Eddie Guererro, and Reid Flair all come to mind). Enter the Riott Squad, doing their utmost best by kicking Nattie while she was down. 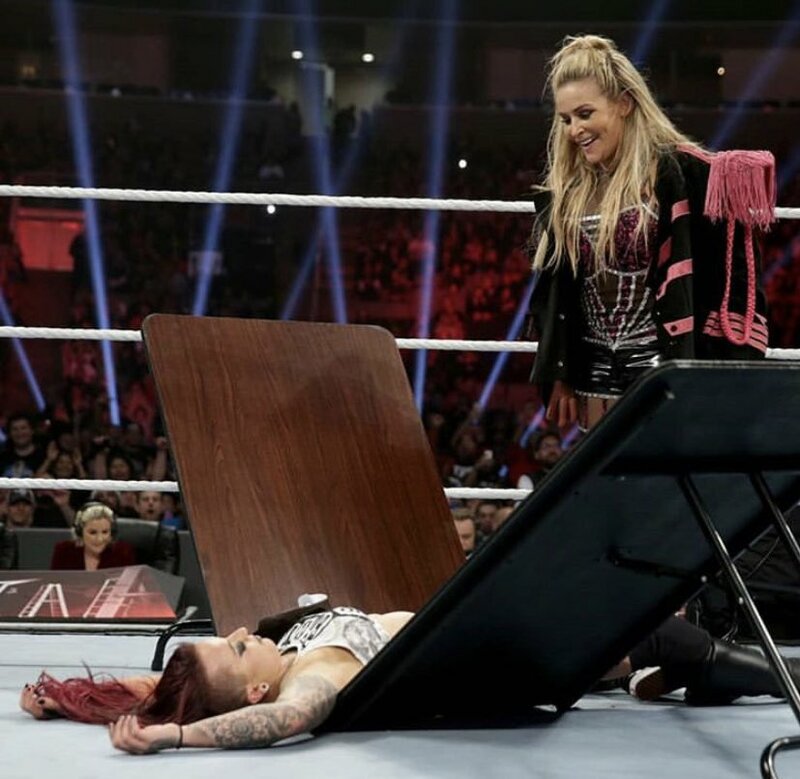 Between beatdowns and mind games that invoked her father’s memory, Nattie was able to vanquish her foes by putting each member of the Riott Squad through tables. While this doesn’t really shift Nattie up or down in the grand scheme of things, it’s the pay off that makes this such a win for her. She lost someone close to her, and she’s fighting for their memory and honor, as well as for herself. Who can’t relate to that? She was able to face adversity and put it through a table with the image of her adversary on it, delivering the most emotionally satisfying victory of the night; also making Nattie now 2-0 in table matches. Last night she had the misfortune of being in what some would call the “lower tier” women’s title match. Her feud with Nia Jax never really got much hype, or storyline pushed forward, and a lot of their talking points had to use Becky Lynch. Not to mention, with both women being labelled “unsafe” and “basic” in the ring, many fans didn’t really expect much. They turned the party. The story was centered around the fist of Nia Jax, and they delivered. Ronda had to use a myriad of different ways to work over Jax’s arm, and she flowed seamlessly when transitioning. Rousey also expanded her move set, which has been a common complaint with her matches. Rousey’s undefeated streak stays intact, and she will probably hold the title until WrestleMania. She was able to win in her toughest challenge to-date, and on top of that, managed to cost two of her biggest foes the SmackDown Women’s Title. In doing so, she was able to get the ball rolling on what can be the biggest match and feud in WWE women’s wrestling herstory. Onto Asuka. Nobody needed this win as badly as she did. While the match was mostly the “Becky and Charlotte Show”, Asuka showed up and showed out, especially when she started wearing out “The Man” and “The Queen” with the kendo stick. This is what “The Empress of Tomorrow” needed. She started off 2018 as a serious threat, and looked poised to do some damage when she made the main roster and won the Royal Rumble, only to flop. She spent more time as Cathy from Catering with Naomi than she did wrestling. She lost to Carmella twice, and prior to her winning the Battle Royal, and last night, the TLC Match, she was an afterthought. She got redemption for an awful year, and hopefully the trend continues. We don’t need another stranglehold on the title, and we don’t need a 500-day winning streak, but Asuka needs dominant booking again. This leads to a fresher women’s title picture. 10’s across the board. No matter the outcome, Becky Lynch would have come out a winner, last night. She delivered in her TLC match, which she only lost due to outside interference, she now has feuds potentially with four women concurrently, and she got a measure of revenge on Nia Jax. As it stands now, Becky is beefing with Charlotte, Nia Jax, and Ronda Rousey, and because she is offered a rematch for the title, she now has a fourth person to go after and deliver yet another great performance with. Finally, she should move on to the feud, be it single- or triple-threat, with Ronda (and/or Charlotte). Every woman on the card won, truthfully. Alicia made it to the MMC finals, Charlotte put up a great fight and endured a nasty spot with her ribs, Nia did well in her match, The Riott Squad gave Nattie a huge win and us some fun along the way. So, who do you think was the biggest winner last night?